The French website specialized in classified boat ads, sailboats, ribs, engines and accessories continues its development by proposing since a few weeks a new version of its web support fully reviewed et now full-responsive web support. The French website, which is specialized in classified boat ads, sailboats, ribs, engines and accessories, Youboat from now on is available in the United Kingdom, in Italy and in Spain. Furthermore, the platform proposes a new version of its completely reviewed and now full-responsive web support. Meanwhile, with Youboat’s 19,000 listings in France, we wanted to make its recognized services available to other countries. 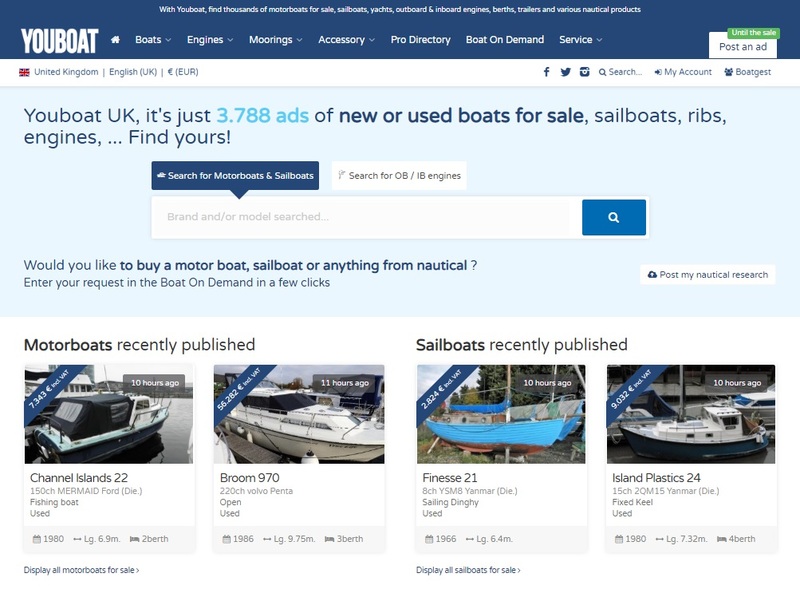 Now available in the United Kingdom, Italy and Spain, the offers of sellers, brokers and dealers in the said countries are now available for consultation on www.youboat.com. Unlike other players in this field, Youboat proposes to the internet users who are in the targeted countries, ads which are offered from local dealers. The website does not only simply propose a simple translation from its services, but a better vision of the nautical market for the purchase of a boat, a sailboat or nautical accessories in the country in question. Nevertheless, a translation has been done by our team (not automatic) and is proposed for each version in order to satisfy you. For example, foreign tourist who may be searching for a boat during their vacation. "In recent months, we have noticed that many foreign Internet users were using our support to search for a boat. With more than 19,000 ads from French sellers, our successful development in France had to go international and offer a real alternative to international supports that only presents a global stock "explains Ersin Eroglu, General Manager of the SME based in Orleans, City in the Centre of France. Concerning the launch, all the professional services of its CRM solution "Boat’Gest", including of course the management of ads on Youboat UK, ES and IT are available free of charge* for all vendors in the target countries. The Boat advertising website is looking further ahead and plans to open its specialized search engine in Germany and the Netherlands in the coming months. The United States also represents a significant market for Youboat. Note: Youboat is also available in France in paper format with an editorial specialized Motor boating and available on newsstands every two months. * for the first 6 months. Paper and digital nautical media created in 2011, Youboat focuses thousands of nautical ads published by professionals and individuals. Bringing together the buyer and the seller, Youboat also stands out for its "Boat on Demand" product, which enables to offer stakeholders in the nautical industry a database of qualified potential buyers and optins. Aymeric Cassan, Ersin Eroglu and Grégory Chateau are the three founders of Youboat. With a solid experience in the nautical industry, the specialised press, the Internet and marketing, they founded RIVAMEDIA in 2011, renamed MOTORS GATE. The SARL publishes advertising sites and editorial magazines in thematic niches, including boating, luxury cars and motorhomes.